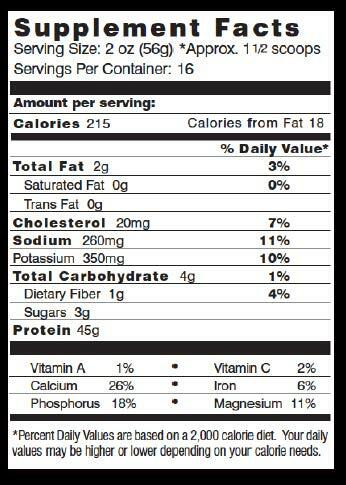 Try our Chocolate Protein French Toast Sticks made with this powder! Try our Protein Mochaccino made with this powder! INGREDIENTS: Pro-Amino™ matrix of 100% Pure and Natural Ultra and Micro-Filtered Whey Proteins, Whey Peptides, and Whey Amino Acids (with Whey Protein Isolate and Whey Hydrolysate) [The Highest Quality, Guaranteed Most Effective, Scientifically Documented, Tested and Assayed Whey (with NO fillers as found in other brands) Very High in BCAAs and Essential Amino Acids with the Added Benefits of Natural Peptide Bond Amino Acids for the quickest and most efficient delivery of Amino Acids to Muscle plus Efficacious naturally occurring Whey Protein Fractions consisting of Beta-Lactoglobulin, Alpha-Lactalbumin, Glycomacropeptides, Immunoglobulins, Serum Albumin, and Lactoferrin], AN INTRINSIC INFUSION™ OF ENHANCED AMINO™ (consisting of Ultra Recovery™ Amino Acids Matrix of L-Ornithine & L- Glutamine, Thea-Max™ L-Theanine, and Additional Correct Proportion™ Ratio Technology BCAAs [L-Leucine, L-Valine, L-Isoleucine]) [all delivering Additional Powerful Maximum Nutritional Support for Increased Muscle, Strength, Recovery and Fitness (in concert with progressive training) and Extensive Health and Well Being Benefits], Dutch Cocoa Powder, Natural Flavors, Natural Stevia Herb, Healthy ‘N Zyme™- Digestive Enzymes consisting of Natural Papain and Bromelain (from Papaya and Pineapple), Lecithin. SUGGESTED USE: Stir 10 scoops into approximately 8 oz. of water, juice or low fat milk (mixing with milk will make the shake thicker and creamier). Use once or twice daily between meals or after your workout to add the Most Natural, Purest, Cleanest, Highest Quality, Guaranteed Most Effective 100% Pure Whey to your diet. You can add 100% WHEY PRO-AMINO™v2.0 to oatmeal, muffins, pancakes, shakes and more, your imagination is your only limit to the vast array of its uses. To also view dozens of Protein Shake Smoothies, Protein Freezes and Protein Freeze Bar recipes and Heavenly Treats, as well as baking and cooking ideas, visit our website. For those looking to build muscle mass and strength, many trainers and athletes suggest consuming one gram of protein per pound of body weight. This includes all the protein containing foods that you eat. Use 100% WHEY PRO-AMINO immediately after your workouts and between meals. Try to ingest protein every 3-4 hours. NOTICE: Do not use as a sole source of nutrition. A proper diet and exercise program are essential to reach your training and health goals. As a reminder, it is always recommended to check with your physician before using any dietary supplement or before starting an exercise program to be sure you are in good health; especially if you are taking any medication, have a medical condition, are pregnant or nursing. If this product or any product doesn’t agree with you, stop taking it. Keep out of the reach of children. This is a Natural product, and as it is with all Natural products,its appearance and taste may vary. Store in a cool, dry place; do not refrigerate. This bottle is filled (*and should be measured) by weight, not volume. Settling of contents occurs during packaging, shipping, and handling. A scoop is included but may settle to the bottom. This bottle is BPA free and Recyclable.